Why just put cheese ON your meatballs when you can put cheese IN your meatballs? Pepper Jack Stuffed Meatballs with Chipotle Sauce ooze with cheesy goodness. Definitely NOT your average meatball! Pepper Jack Stuffed Meatballs with Chipotle Sauce will rock your meatball world! Meatballs are a popular item with my clients, so I’ve made a few in my career. Here are some tips and tricks to make the process go faster and give you even-sized meatballs. Get all the ingredients except the ground meat mixed together first. This ensures all the ingredients–especially the seasonings–are evenly distributed. When I mix up any ground meat dish, I wear disposable gloves and mix with my hands to get the job done faster and more thoroughly. The best way I have found to portion and form meatballs is with a cookie dough scoop. I have several sizes and for these, I use my 1 1/2-inch scoop. Grab a handful of the meat mixture in one hand and the scoop in the other. Use the heel of the hand holding the meat mixture to level off the scoop. Empty the scoop on a baking sheet. After portioning the meat mixture, press the cheese into the center and roll into neat balls. If you don’t have a large cookie dough scoop, press the meat into a rectangle shape on wax paper on your counter, cut into 24 even squares, stuff, then roll into neat balls. It’s important to keep the size of the cheese cubes to about a half inch. Any larger than that and you’ll have more cheese on your baking sheet than in your meatballs. A little will ooze out, but I think it adds to the cheesy goodness. Use a good-quality Pepper Jack cheese such as Cabot rather than a Pepper Jack processed cheese product. A processed cheese product will really ooze out! I admit to being a lazy meatball maker. Although frying does give you a nicely browned exterior, frying meatballs is messy and requires more active time and attention. Instead, I place them on a foil or parchment-lined baking sheet and simply bake them. Ground beef should always be cooked to 165 degrees in the center. Serve over rice or pasta. Enjoy! Heat oil over medium-high heat in a large saucepan. Add the onion, reduce heat to medium and cook 8 to 10 minutes, stirring often or until onion is soft. Add remaining sauce ingredients, bring to a boil, reduce heat to low and simmer 25 to 30 minutes or until thickened. Adjust seasoning as desired. Preheat oven to 375 degrees. Line a baking sheet with nonstick aluminum foil or parchment paper. Spray with cooking spray. In a bowl, combine egg, milk, oregano, cumin, salt, pepper, garlic and panko and mix well. Add the meat and mix well. Form into 24 1 1/2-inch meatballs. Press a cube of cheese into the center of each meatball , making sure the cheese is securely in the center. Place on prepared baking sheet. Bake for 15 minutes or until center is cooked through to 165 degrees. MAKE-AHEAD: The sauce can be made 2-3 days in advance, cooled and refrigerated. The meatballs can be mixed and rolled 1 day in advance. (Be sure ground beef is very fresh.) Reheat sauce on the stovetop and bake meatballs prior to serving. TO MAKE GLUTEN-FREE: Use gluten-free panko or crushed rice cereal such as Rice Chex. These will certainly please a crowd! I love making homemade meatballs, adding cheese to the center sounds amazing!! I could probably eat that whole bowl of meatballs. Looks SO good. I’ve never made meatballs stuffed with anything before! What a cute idea, and I’m sure everyone loves them! I also love using a cookie scoop to shape my meatballs – it is so much easier! These look delicious and I love the flavors going on! Life is definitely brighter with cheese melting all over it! Those meatballs look amazing! 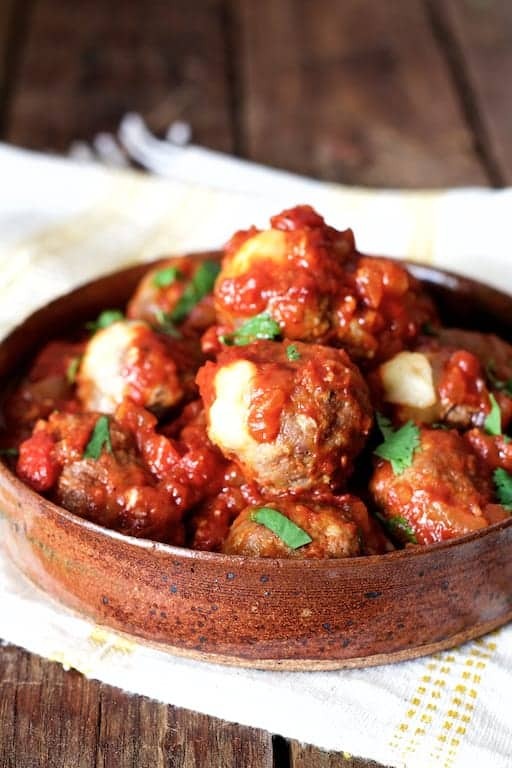 I completely agree with why have cheese on when you can have it inside your meatballs, love these and that sauce looks so rich and delicious!